Today I had a grilled salmon salad with a few of my colleagues at a harbourfront restaurant. It had a small mountain of sweet and bitter lettuces of various textures tossed in a balsamic vinaigrette, a small mound of diced tomatoes, a few spears of smoky charred asparagus, and a haystack of crispy shoestring potatoes and it was delicious. The salmon was well seasoned, with grill marks to put any neighborhood barbecue daddy to shame and cooked perfectly – buttery with the fat between the muscle layers just melted and the flesh itself just turning opaque. But c’mon guys, it’s 2017, it’s okay to show some skin. Which brings me to this salad, which screams spring to me and justifies the fact that I’m sharing a salad because it’s 68°F in Baltimore today and also because lunch reminded me. The crispy pan-seared trout has skin you can hear crackle under the pressure of your knife. 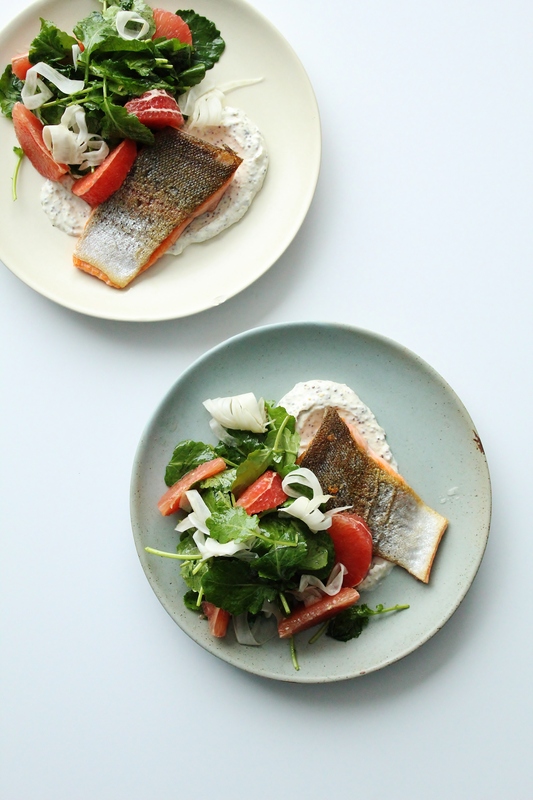 The sweet fennel-pickled-fennel cuts through the fattiness of the fish and provides a refreshing crunch to the salad. Bright ruby red grapefruit has bitterness that harmonizes with the muted bitter tones of the kale. All of this is brought together with a smear of mustard creme fraiche for tang and because the tiny pops of mustard bring this dish to a new level. Put the fennel seeds, sugar and vinegar in a small saucepan and bring to the boil until sugar has dissolved completely. Pack the shaved fennel tightly into a large mason jar. Pour the hot sugar-vinegar liquid over the fennel and seal with the lid. Cool to room temperature before storing in the fridge for at least 3 days and up to 4 weeks. Stir together all ingredients in a small bowl. Cover with plastic wrap and keep in the fridge for up to 2 days or until needed. Preheat a cast iron skillet until very hot. Tip the oil into the skillet and swirl it around so the bottom’s evenly coated. The oil needs to look shimmery – it means that your pan is hot enough. Season the skin-side of your trout and lay the skin-side down in the skillet. It should sizzle immediately. Shake the pan a few times to prevent it from sticking, but if it does just be patient – once the skin is ready and crisp it will loosen from the pan. Season the top side and watch the flesh turn opaque up the sides – this gives you an idea of how cooked the piece of fish is. Once it’s opaque past halfway, and the skin releases from the pan (about 3 minutes), flip it over and cook another 2-3 minutes before transferring to a plate to rest with the skin side FACING UP (we didn’t go through all that tending and watching to have our skin go soggy at the last minute)! In a salad bowl, whisk together the reserved grapefruit juice, olive oil, mustard, salt, and pepper until emulsified. Add the kale and grapefruit segments, then toss gently with your hands to coat and combine. Plop a dollop of the mustard creme fraiche on a plate and smear it across with the back of your spoon. Top with a piece of seared trout. Grab a handful of the petite salade with your two hands and lay it down gently beside the trout. Finish with a few pieces of pickled fennel here and there, as you like it. Enjoy! I think something bubbly would be appropriate, because it’s spring and we’re eating pretty things. Yeah?